Your style. Your golfer. Your game. Plug it in, play and roll it away when you’re done! Hook it up to almost any HD television, plug it into the Ethernet, and play online in 1080p! 6 months free home online play! The Online Golden Tee Home Edition comes fully equipped with everything you've grown to love in the game. The only major difference is that Prize Play is not available. However, we do run Callaway Golden Tee Home Edition Tour events regularly—monthly contests specific for users who are online. With the game and purchase of a subscription, you’ll have access to an assortment of exciting features and additions—some new to Golden Tee 2016. Compete against Golden Tee players around the world in Online Contests and Stats Play, both of which are available on the Golden Tee Home Edition. These online contests feature 20 players, and you are free to enter as many as you’d like. Call a friend and have him meet you on Antelope Pass for a game of two. You can also topple personal bests while playing in Stats Play with your trusty equipment at your fingertips. Want to see how you stack up worldwide? Play one game on each course during a month and receive a Golden Tee World Ranking. You'll also be able to monitor your progress on your game on the GT Caddy —Golden Tee’s free player app. The full arsenal is yours. Every. Single. One. All 55 Golden Tee LIVE courses—from the Great Pyramids, to the Grand Canyon, to Mount Everest, to New York City—will be delivered to you on your Golden Tee 2016 Home Edition. Take a trip back in time to the courses you played when you first started playing. Or, perhaps these classic creations will still be new to you. And yes, the 2016 courses—a mix of lovely stops around the world—provide ample opportunities to score and compete in exotic location. 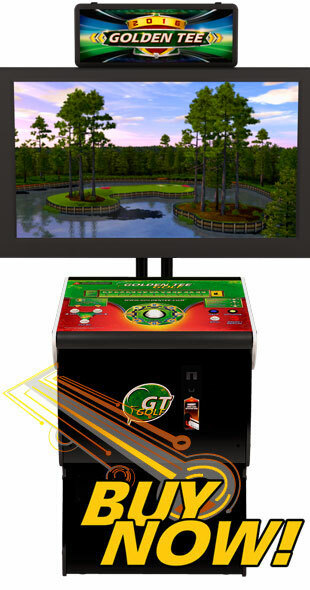 In previous versions of Golden Tee, players had access to a special version of the game that was somewhat limited in nature. With the launch of an exciting new Closest-to-the-Pin game mode—the perfect party option—those days are long gone. You have nine shots at nine different holes. It’s not just a matter of getting close on one shot; it’s about staying consistent, and yes, staying close to the cup. Dress your golfer just the way you like him, and earn clothing achievements just like you do in the bar. You'll have access to hundreds of different clothing options and also win new items for various achievements met during game play. As if a hole-in-one wasn't enough, now you can win a space suit or beekeeper helmet you always wanted. You wanted one, yes? We thought so. These clothing items will stay with your character forever, regardless of where you play. Win the item, throw it on your golfer, and he or she will stay that way whether you play in your basement or the tavern down the road! You can also unlock exclusive new items—like a super creepy clown—on the GT Caddy. It’s not just about looking the part. The Golden Tee Home Edition wants you to play the way you like as well. All high-performance clubs and balls that are available in Golden Tee LIVE 2016 will be available for play! No need to purchase new clubs, balls and tees. You'll have access to the full cabinet on your individual game. Unlike clothing, the items utilized at the home will not be available for play on Golden Tee LIVE cabinets unless they were previously owned. NEW: Build-A-Bag creations will carry over to your Home game! Create your dream set, name it and then use it in your man cave! You just hit the once-in-a-lifetime shot. Now what? Upload it to YouTube™, of course. Then, share it with the world! Celebrate the shots that truly matter when they happen and share them with friends, family and complete strangers (whether they like it or not). Golden Tee Great Shots have come to the home, and now your finest trackball efforts can be saved, uploaded and shared. If you're at least 100 yards out and your shot finds the bottom of the cup, you'll be prompted to upload this shot by providing an email. Follow the easy steps, and your GT moment will be up on YouTube™ in no time—free of charge. 1Monitor not included. Cabinet connects to most HDTVs. HDMI connection recommended. 2Integrated Stand available at an additional cost.